Waiting for a command before setting off to fetch a retrieve, is all part and parcel of learning to be a well behaved gundog. In this article, we will look at one way of introducing steadiness to fall. This will take you several sessions over several days to complete. With a very ‘hot’ dog it might take a week or two. Once you have started the process, all opportunities to run-in should be denied. It is best to stop all retrieving practice for the duration. This is a method which enables the dog to progress with very few, if any, corrections. It is not the only method, but it is now my preferred one. It is important that you don’t attempt to ‘steady’ a dog that is not yet passionate about retrieving. [wp_ad_camp_1]Serious steadiness training may interfere with a young dog’s enthusiasm for retrieving if introduced too early. Let your puppy chase after retrieves for a while. Build up some passion before asking him to be a ‘grown up’ and wait nicely for your cue. You will sometimes see people teach steadiness by ‘restraining’ the dog with an arm or a lead whilst they throw a dummy. I don’t teach steadiness like this. I teach it initially with the dog sitting facing me, and without touching the dog. This gives me more control over the ‘power’ of the dummy (see below). For this reason you will need to teach the dog to sit and stay reliably whilst you move a short distance away, before you commence this training exercise. The sight of a falling dummy is a ‘distraction’ for a keen retriever that has been asked to sit and stay. It is a strong temptation to move and disobey you. As always in training, we can keep our handling methods more positive if we set the dog up to win by introducing distractions very gradually, from low power distractions to very powerful ones. And by increasing the power of any given distraction very slowly. But how can we alter the ‘power’ of our falling dummy? How can we make it less distracting to the dog? The answer lies in a number of different factors. To begin with we introduce the dummy by gently dropping it to the ground from our outstretched hand. The dummy has only a short distance to fall and is relatively unexciting to the dog. Once we are confident that the dog can hold a sit/stay, through this process we can start the make the dummy move a little faster. Some dogs find a dummy that falls from a considerable height, far more exciting than one that just skims the ground. Be aware that introducing a high thrown dummy can trigger a break from the stay. So do this gradually. A dummy thrown to land at considerable distance from the dog, may be less exciting than one that lands just under his nose. Especially if the other factors of temptation are high. The dog is less likely to ‘break’ the stay if the handler is placed between the dog and the dummy, so that the dog would have to pass the handler in order to reach the dummy. This also enables the handler to pick up the dummy before the dog does, if things go wrong. Thus ensuring that the dog does not get a reward for breaking his stay. Using the information above, we can make a start at setting the dog up to win with steadiness to fall. Begin with the dog sitting facing you and back away a few steps. Have a dummy ready in your hand. Bend over so that your hand is only a foot or two from the ground and drop the dummy very gently behind you. Most dogs with a practiced stay, will not move when you do this. The dummy just is not tempting enough. Watch the dog carefully the whole time. If he starts to get up give him a ‘no-reward’ marker (I just say AH-AH! quite sharply). Return to the dog, walk him on at heel a few paces then try again. As soon as the dog remains seated whilst you drop the dummy on the ground, which may well be the very first time you do it, give a reward marker (I use ‘good’) pick the dummy up again, return to the dog and reward him. Walk the dog on at heel a few paces and repeat. When you can do this successfully five times in a row, it’s time to increase the power of the dummy just a tiny bit. If you look at the list above, you can see that there are several ways to do this. Pick just one. I suggest you start by making the dummy a bit more lively. Throw the dummy to land a few feet behind you. Imagine that you are standing in the middle of a clock. The dog is sitting facing you, with his back to 12 o’clock. Start throwing the dummy well behind you towards 6 o’clock. The dummy is moving a little faster now, but you are still between the dog and the dummy. Get this right and then you can start throwing the dummy to 7 o’clock and to 5 o’clock. The dog has a clearer view of the dummy now. But your position is still quite a strong visual barrier. When he is successful with this you can start throwing the dummy to 8 o’clock and to 4 o’clock. This is more tempting for him now, so throw gently and shorten the distance a little. This is where people often start forgetting to reward the dog. Don’t switch to intermittent rewards yet, you are increasing the level of difficulty and the dog needs a reward for every correct response. Go to the dog and feed him or give him some affection if that is what he likes. Walk him on a bit to relax him before trying again. When we increase one factor of difficulty, it is important to decrease the others for a while. As you begin throwing the dummy towards 9 o’clock and 3 o’clock (to either side of the dog) things are getting more tempting for him. Make sure that you are really close to him so that the two of you are in the middle of the clock together. Use your physical presence to focus his attention on to you. Use bigger rewards if he is struggling. Once the dog is able to sit calmly and watch the dummies fall to either side of him you can begin to move further away from him. Leave him in the middle of the clock, still throwing dummies to 3 and 9, whilst you back away towards 6 o’clock. Just a few feet at a time. Take it slowly. To increase the power of the dummy further, you will start throwing them so that they pass slightly beyond the dog (to 10 o’clock and 2 o’clock). Always move closer to the dog before you do this and back away slowly once he is steady. Keep progressing until you are able to leave the dog in the middle of the clock, back away to 6 o’clock, and throw the dummy directly over the dog’s head to land at 12 o’clock. Once your dog has mastered this, you can begin to increase other factors of difficulty. Start introducing faster moving dummies, and high thrown dummies. It can be helpful to get a friend to throw for you at this stage, so that you can stand very close to the dog until you are sure he is coping. Then move away gradually. Once the dog can sit very still whilst dummies soar over his head, or skim past his nose with you stood twenty yards away. You will have done a good job at basic steadiness to fall. Now you can begin to re-introduce some retrieves. Only allow the dog to pick up one or two dummies for every dozen or so that you throw to begin with. Unless you have a regular ‘thrower’, you will need to do quite a bit of walking! You now need to build on this with steadiness to fall at heel and for spaniels, steadiness to fall whilst hunting. We’ll look at that in another article. 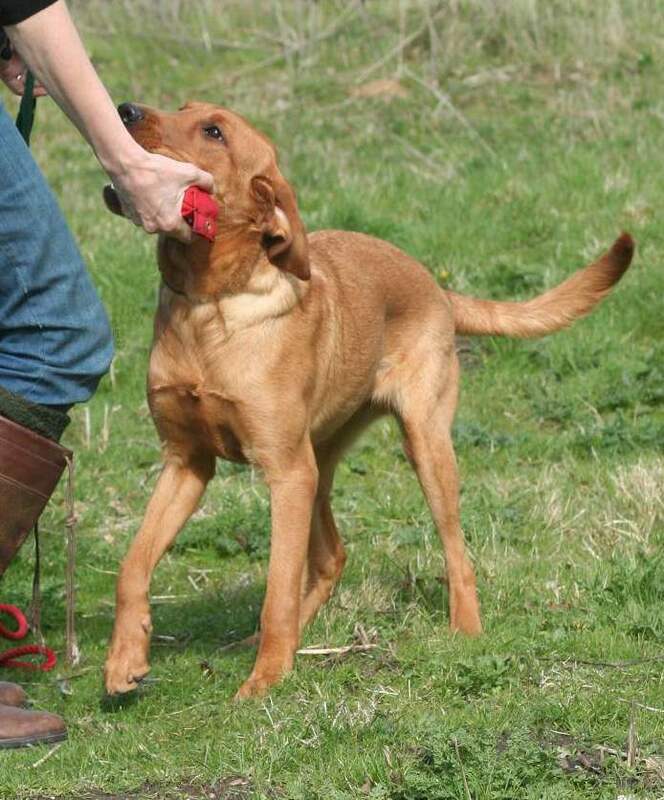 You can find more information on developing the retrieve in a young retriever in the Gundog Club’s training guides. 3. Sitting on the peg – generally she is very steady on her sit and no issues throwing dummies past her nose etc. She has sat still while muntjac have run past her from cover etc. When we are shooting I have been trying to have her on the peg without a lead and pin. She will sit well but gets excited when the drive starts and if a bird falls reasonably close (esp if it is not fully dead) she can’t help herself but tear off to get it even if I shout at her to leave it. She will bring it straight back and doesn’t disappear into the cover or anything, but I would love to correct this as she is overall such a great dog. Pippa, I have a query re the next steps in the steadiness training you have outlined above. I am training a 2yr GSP, and he is rock steady to hand thrown dummies in all directions and heights and speeds. It all falls apart when the dummy launcher or shotgun is introduced. With limited success I have been firing short dummies (dummy only half way down the spigot), and the dog will sit but its clear to all hes just itching to run in. I have been making him sit while I walk out and pick up the dummy, this works about 70% of the time. Other times I let him pick up a hand thrown dummy after the launcher dummy has been fired. Do you have any guidance on how progress from the above training to using the dummy launcher and the shotgun? Hi Colum, launched dummies are incredibly exciting and it is difficult to ensure that the dog cannot reach the retrieve if he breaks. A better interim way of ensuring steadiness to shot is to get a helper to fire a shot and throw a dummy close to him so that he can pick it up if the dog breaks. The key with this method is making sure the dog never gets the dummy if he fails to remain steady.